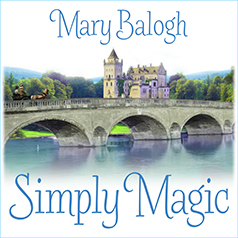 New York Times bestselling author Mary Balogh returns to the elegance and sensuality of Regency England as she continues the enthralling story of four remarkable women–friends and teachers at Miss Martin's School for Girls. Contains mature themes. On a splendid August afternoon Susanna Osbourne is introduced to the most handsome man she has ever seen . . . and instantly feels the icy chill of recognition. Peter Edgeworth, Viscount Whitleaf, is utterly charming—and seemingly unaware that they have met before. With his knowing smile and seductive gaze, Peter acts the rake; but he stirs something in Susanna she has never felt before, a yearning that both frightens and dazzles her. Instantly she knows this brash nobleman poses a threat to her heart and to the secrets she guards so desperately. From the moment they meet, Peter is drawn to Susanna's independence, dazzled by her sharp wit; he simply must have her. But the more he pursues, the more Susanna withdraws—until a sensual game of thrust-and-parry culminates in a glorious afternoon of passion. Now more determined than ever to keep her by his side, Peter begins to suspect that a tragic history still haunts Susanna. And as he moves closer to the truth, Peter is certain of one thing: He will defy the mysteries of her past for a future with this exquisite creature. All Susanna must do is trust him with the most precious secret of all . . .